Roll Off Truck Replacement! The Super Mini – (734) 722-8100 – 30383 Ecorse Rd., Romulus, MI, 48174. A ROLL OFF TRUCK REPLACEMENT FOR ONLY $39,995 + FET! WE STOCK BENLEE SUPER MINI ROLL OFF TRAILERS! The BENLEE Super Mini Roll Off Truck replacement is a short 25’11” – that’s only a few inches longer than a roll off truck (when the trailer is attached to a tractor). The Super Mini is optimized for the same 20/30/40 and tall 50 yd boxes, but can haul up to 50% more weight legally. A Roll Off Truck can last only as long as the Tractor- but with a Super Mini, you get a more maneuverable, heavier hauling, cheaper Roll Off Truck that can detach from the Tractor if the Power Unit breaks or is needed for another Trailer. Roll Off Trucks are useful because their short length makes them more maneuverable than a tradition Roll Off Trailer- but the BENLEE Super Mini Trailer has all that maneuverability and MORE! The Super Mini (when attached to a Tractor) is almost as short as Roll Off Truck; but because the Super Mini is a trailer, it has a hinge pin which gives it additional maneuverability. The Super Mini can actually get into an even tighter spots than a Roll Off Truck! 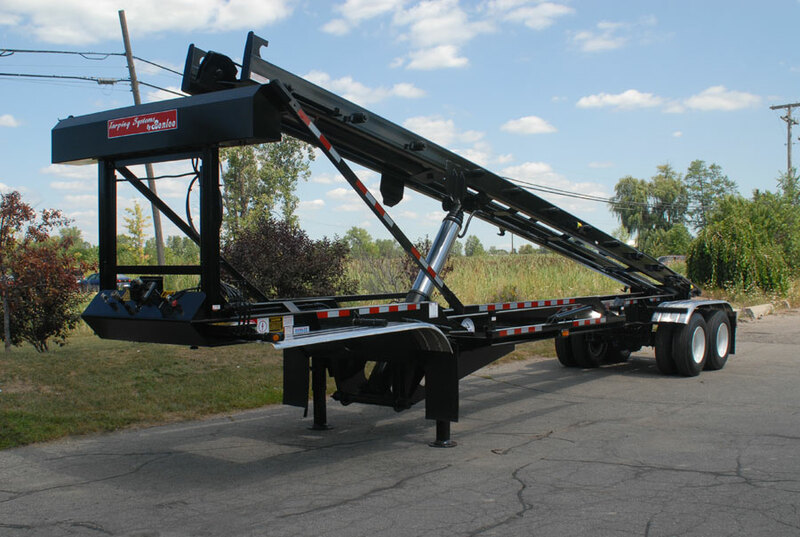 Built with the same heavy duty 25,000# axles, hydraulic system, rollers, sheaves, etc. as our larger units, the Super Mini is small but mighty! Every trailer we make is tested on the same 54,000# test box- that’s much more than you could ever carry legally! Next time you’re looking for a Roll Off Truck, call BENLEE and buy a Super Mini Roll Off Trailer Instead! Roll off Trailer manufacturing and selling direct to the industry is what we are about at BENLEE. Our 40′ BridgeMaster, an 80,000 GVW unit is the best of the best in the market with it’s full frame stability and only weighing 17,500 lbs. Of course we make our “Conventional” 40′ unit that weighs 22,000 lbs. and can be over permitted to carry over 100,000 GVW, but in these days of optimization, the BridgeMaster is the unit to use.